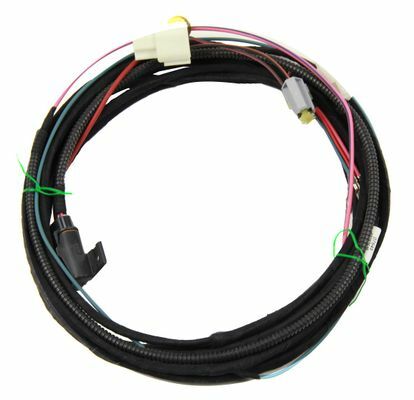 Trailer Tow Wiring adapter for vehicles without overhead console only, must be used in conjunction with 7-Way Round Connector - Item #: 82207248AB. The cable is the right length to get from the battery to the cargo area and tucks away nicely. The only problem I had was that the part of the harness which plugs into the front power outlet is not positioned quite right for later model KJ's. Originally, the Cigarette lighter and power outlet were on the left side of the center console, whereas on my '06 its on the right side. This makes the cable a little bit of a stretch to get over to the firewall boot under the steering wheel. Getting the cable through the rubber boot in the firewall was tough. I ended up using a hard plastic straw to feed a nylon string through the firewall and tied it to the battery wire to pull it back through. Worked like a charm first try. ConsPower outlet harness is not positioned quite right for later model KJ's with outlets on the right side of the console. It works, but its tight.